Imagine you are shopping for an upcoming vacation. You walk into a department store, you have no idea where to go and start looking around for anything you need. Now imagine a store associate comes up to you right as this moment and asks, “Can I help you find anything?” You tell her you’re just browsing and she mentions, “Well, we just marked down a lot of our most popular sunglasses.” How did they know? You lost your sunglasses two weeks ago and have been meaning to replace them ever since. That friendly reminder about sunglasses is similar to what an Engagement is, our latest conversion rate optimization tool for websites and apps. Websites and apps don’t have in-person customer service like this, and that’s where a tool like Engage comes into play. Read on and we’ll tell you how we used it at Kissmetrics for a successful product launch and increased conversion on our blog. In June of this year, we launched a new product called Engage, which allows you to set up smart onsite interactions to a segment of your audience with a personalized message–in order to guide them into conversion. And while very exciting, it was also a bit challenging to introduce a new product that was very different from our core product, Analyze. Even though we had promoted the new product at the time of the launch, there was still a segment of our users who didn’t know what Engage is or why they should use it. Because the product is so new, we wanted to see if we could increase adoption of Engage by using Engage. Basically it’s an Engagement about Engage–so meta, right? 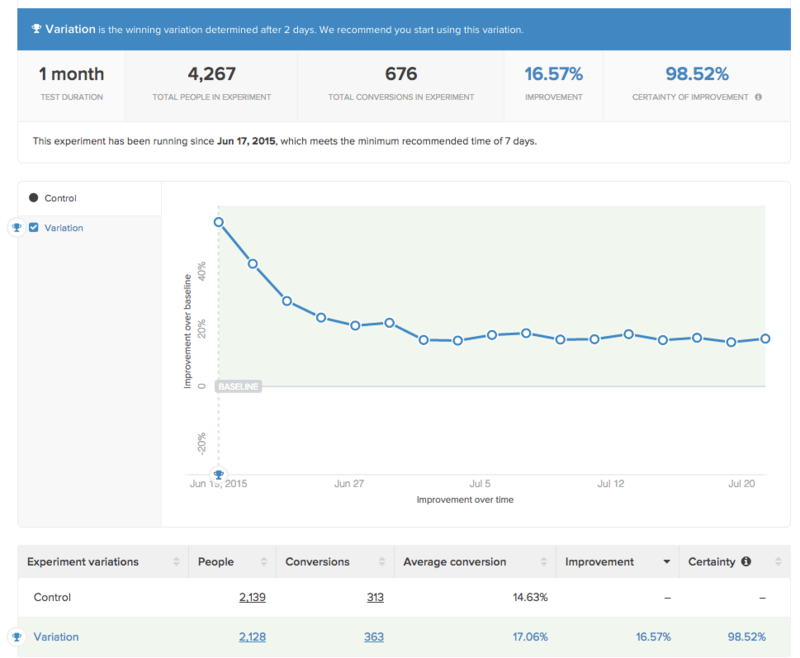 We set up an Engagement within the app and served it 50% of users who logged into Kissmetrics as an A/B test. It fired immediately upon loading the page. The variation with the Engagement received a conversion rate 16.57% higher than the control! This was one of the most effective and easiest way to drive adoption for the product. The user is already in the app, so it’s easier to guide them to the Engagement setup because we’re not disrupting what they’re doing. Our other option besides an Engagement would be to send an email, but it would have taken much longer to write, design, and send the email than it would be to create an in-app notification. And this isn’t just for product launches. If you have just written an eBook or want to promote your best content, you can use an Engagement to guide them in the right direction. While our blog already has a fairly large email list, we wanted to see what effect launching an Engagement on our blog would have for our conversions. We set up an Engagement to new visitors who have visited the top 50 high traffic pages on our blog. It shows up when you scroll ¼ the way down the page. We’ve included it on this page – you’ve probably seen it by now. 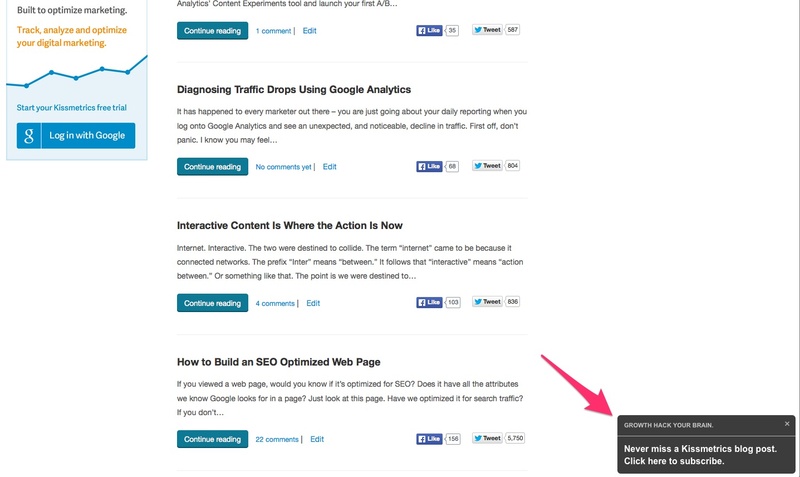 When you click it, it takes you to the blog newsletter signup landing page. Not surprisingly, we saw a 9.2% increase in subscribers per day on average in just one week from 6/29/15-7/6/15. We compared this to the daily average during 1/1/15-5/29/15. If we had used a pop-up instead, the numbers might have looked different. We wanted to start off testing out this bumper because it caught our visitors’ attention in a polite way. We’re not exactly sure yet if our visitors find pop-ups to be annoying or not, so the nudge Engagement was a great first test. The truth is, not all of your visitors will get to your CTA and subscribe, even if they love your content. And not all of your customers open and read your emails about your product launches or newly released. The best and easiest way to guide your audience into conversion (and to cut conversion time in half) is to simply remind them what to do and how to do it–just like friendly sales associates in the store. Want to see more about Engage? Just click the Play button below. Interested in using Engage on your site? Request a personal demo.